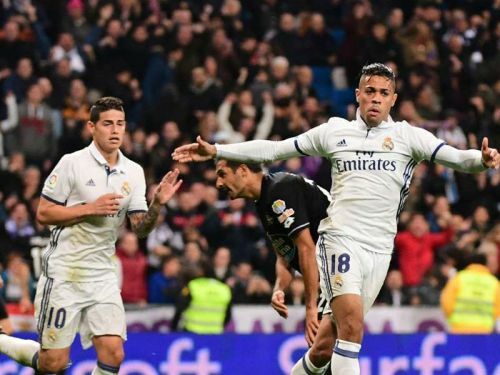 Mariano Diaz: Could Real Madrid's New No.7 be the Unexpected Successor to Ronaldo? After much speculation surrounding Real Madrid signing an attacker, Los Blancos have landed Dominican striker Mariano Díaz from French side Olympique Lyonnais for a fee of around €30 million. The player was a target for Sevilla but the deal broke down and the striker returns to the club where he started his professional career. Born in the Catalonian town of Premià de Mar, he joined RCD Espanyol to begin his youth career. He then joined Real's youth system and was promoted to Real Madrid C in August 2012. He cemented his place in the team during his second season, scoring 15 goals in 26 games. He made his professional debut in January 2013 for Real's reserve side Real Madrid Castilla in the Segunda División, now known as LaLiga 2. He rose to prominence in his second full season with the Castilla in which he found the net an impressive 27 times in just 33 games. His performances did not go unnoticed by then first-team manager Zinedine Zidane and Mariano was promoted to the first team for the 2016/17 season. Playing the role of a backup striker to Karim Benzema and Alvaro Morrata, Mariano did not feature much during that season. His playing time was cut short mainly due to Real's early Copa Del Rey elimination at the hands of Celta Vigo. Perhaps his best highlight from that season was the equaliser he scored in Real's 3-2 comeback win against Deportivo de La Coruña at the Bernabeu. Despite winning the Champions League and league double with Real, Mariano joined Lyon in the summer, looking for more playing time. The season turned out to be a breakthrough one for Mariano, who formed a formidable attacking trio with Memphis Depay and Nabil Fekir, guiding Lyon to an impressive third-place finish that enabled them to qualify for the Champions League this season. Díaz scored 21 goals in 48 games last season - an impressive total for his first campaign in France. The youngster said that he was very happy to return to the "best club in the world" but he has an immense, almost unbelievable, amount of pressure on him, and he hasn't even stepped foot on the pitch yet. The reason for that is President Fiorentino Perez's rather surprising decision to hand Díaz the No.7 shirt, which famously rested on the back of a certain Cristiano Ronaldo until May. This might indicate a substantial policy change by Perez - the All-Whites haven't signed a Galactico in the past four years, with James Rodriguez being their last big name signing. The past few seasons have seen the emergence of a number of quality young players, Marco Asensio being the most notable. 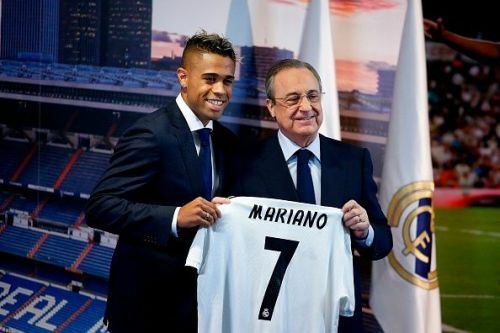 This major shift by Perez, allowing the club to sign highly-rated young players instead of superstars, might help Mariano ease into his role as the new number 7, taking some pressure off his shoulders. It will also allow new manager Julen Lopetegui to build a team for the future - built around promising youngsters such as Mariano. The pressure that comes with wearing with number 7, however, will be enormous for it has been worn by some of the most legendary players in Real's history - Raymond Copa, Juanito, Emilio Butragueño, Raúl, and, of course, Cristiano Ronaldo. The striker will definitely have to work hard to live up to the expectations that come with the famous shirt. The faith that Real have shown in his abilities should motivate him and at just 25 years old, he is yet to hit his peak. If he does manage to do the unthinkable, and successfully makes the number 7 shirt his own at Real, it would be an incredible story of an academy graduate returning to his boyhood club and replacing one of their greatest ever players. 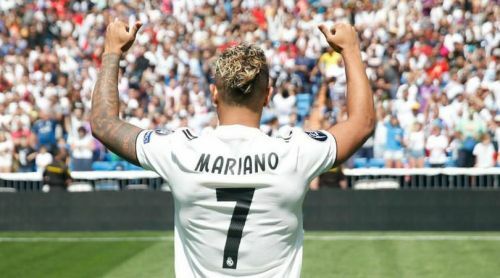 There is obviously a long long way to go before comparisons can be drawn but one thing is certain; Mariano has enough trust in his own abilities because he accepted the offer of wearing the number 7 - almost right after Ronaldo's departure. It is the sort of self-belief that makes Ronaldo the player he is today. Add to that self-belief his pace on the ball, his determination, and ability to score goals - along with the uncanny similarity in Mariano and Cristiano's names - one can't help but think that Mariano could be, albeit the most unlikely, successor to Cristiano Ronaldo.